join it together in your imagination or buy the book! Mobile Magic - the text from page 71 of the book. They sat and devoured their sumptuous meal to the music of frog and cicadas as dusk fell on the eerie forest. None of them felt much like talking; even the scientists felt that they were intruders in a wild territory. The empty containers were repacked and the group began to move quietly and carefully down the slope. Although their eyes had adjusted to the gloom they had to concentrate on where they were walking. The last light lingered in the sky above the treetops. The forest came alive. A wild, joyful call came from overhead, not far away there was a soft plop as something landed on a tree trunk. Athol switched on his spotlight. The beam was directed straight towards a tiny, furry animal clinging to the bark. ‘A sugar-glider, on its way to its feeding tree,’ said Athol in hushed tones. 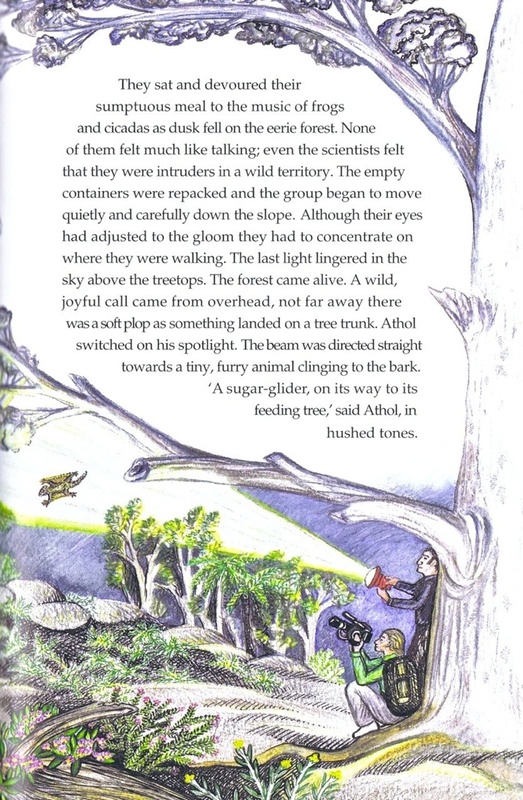 This illustration depicts a sugar glider, Australian marsupial, in the beam of a spotlight, being filmed as it leaps off a high branch and glides to another tree.